Not your usual brunch bake, this blintz casserole is fluffy, creamy and not-too-sweet. Made with cream cheese, ricotta and a touch of lemon, our Best Ever Blintz Bake will be a welcome addition to your next brunch menu. BEAT together 1 lb (500 g) ricotta cheese, 2 pkg (250 g) each softened PHILADELPHIA Cream Cheese, 2 eggs, 1/4 cup sugar, 2 tsp grated lemon zest and 3 Tbsp fresh lemon juice until smooth; reserve. COMBINE 1 cup flour, 1 Tbsp baking powder and 1/2 cup sugar in large bowl. Whisk in 1 cup melted butter, 3 eggs and 1/4 cup milk until smooth; spread 1/3 of batter into greased 13 x 9 in (33 x 23 cm) baking pan. Spoon cream cheese mixture evenly over batter. Gently spread remaining batter over top. BAKE at 300°F for 1 1/2 hours or until set. Cut into squares and dust with icing sugar. Serve with COOL WHIP and fruit topping or jam. Blintz can be made ahead and re-heated just before serving. 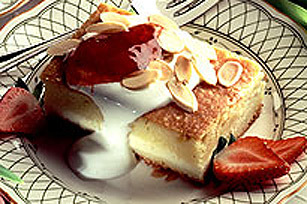 Serve Blintz with toasted almonds, sour cream and preserves.